So we ride distance sometimes short, sometime long because we love to ride. Before we had a motor license it was probably the simple cycle that gave us the sense of exhilarating freedom and taste of wind in the hair. The motorcycle glamorized it and was the next stepping stone and there you are enjoying – BUT hey - did you fall from your bike? Sometime somewhere … You must have as there may not be a perfect born riderJ. Hoping all’s well – as you have to learn to crawl before you learn to walk. Falling is ok as long as the God of chance takes care of us. The safest option gentlemen and ladies would be to sit at home under the bed. But then that’s not our stuff! Riding is also all about overcoming one’s fears of falling and getting a grip on the bike and the road – life itself. Risk is everywhere. There is no place without risk – though you may travel by walking on footpaths, running, cars, trains, airplanes or motorbikes - but what one can do is to minimize risk. 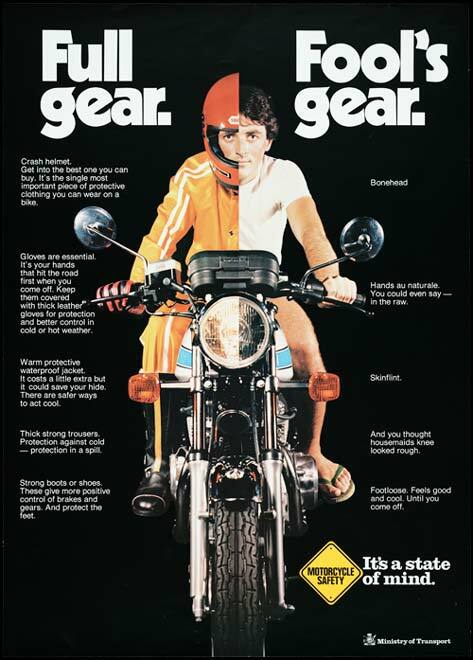 You can wear protective gear while riding; you take care of the road rules, and use your sense of judgment to cruise on your motorbike. That’s about it – what’s in your control. It’s always good to be protected when you are on a two wheeler. Even a small spin just around the corner – because you never know. You can control your elements to an extent. It’s easy to advice – Do this and don’t do this! From experience, I know in our tropical weather like India – dust and 40 degree temperature, rain and sweat, wearing all the protective gear all the time is rarely followed – Classic example , see our 60 year old milkman delivering milk all his life on his motorbike all 30 years balancing the milk cans! – Protective gear? What’s that – Tau ki kare si ? Or the pizza delivery guys or the daily commuters on two wheelers with minimal protection. In the west you have ardent riders commuting to office on their bikes in complete protective gear. I have seen them come in the cold with heater jackets and in the English summer with good air vent jackets. In India it’s a different ball game. From experience, when one falls from a bike, you have the weight of the bike falling on you which drags you along with the bike in motion. The bike should be separated from the rider for optimal safety in a fall – that’s why no bike manufacturer sells bikes with crash guards. It’s always add-on dealer accessories ! Better have a simple small crash bar and not have complicated huge multi level and layer metal crash guards. The aim of the crash guard if used should be only to protect the engine and help you get up and walk away. Wear shoes with ankle protection – your ankle comes under the motorbike weight in a fall and you cannot stand or walk away if your ankle is injured. Full face helmet always – helps protect face, jaws etc from bruises and scars. Glamour and style can take a backseat. Use fancy helmets and half face helmets for photo-sessions and selfies – NOT while riding. Then you have jackets and pants with protectors to protect the joints and spine etc. So with all the equipment all can be safe in event of a fall – though no one can predict how exactly what manner one can possibly fall and the possible damages. Unpredictable. All the research on motorbike crash bars have not been conclusive in any way too. I remember many years ago on a short ride one of my friends had a fall and had face and jaw injury. He was on a bike riding couple of spots behind me. From the hills we approached a small town and some scooter guy jumped across. Blood. ‘RED’ as red can be – the sight shakes a person. Another rider with us had an issue of fainting on sight of blood. We managed to get medical help and ride on. I remember the injured person’s father telling me at the hospital – You guys rode 2000 km in 3 days and he never had a scratch. Now look just a short ride and this is the situation. What to say- I was speechless. The psychological scars are something that takes time for one to recover and get back to riding – and depends on person to person. One has to overcome the fear of falling and ride again. It depends on the injuries and the person’s spirit. Here’s what one of my Croatian friends did in Germany. He bought a bike had a few falls and then decided motor biking is not for him. All being said – all of us have a knack at doing something better. If you do not feel comfortable in something like riding motorbikes, then it’s better to drop it and find something you are more comfortable. Simple. Motorbiking is safe – just the risk of being exposed unlike protected by cage in cars. You have millions of riders some 80 years old and still kicking ! If you love motor biking and know it’s your calling- then RIDE on and - Ride safe. May the God of chance be on our side – Always!